DOI : 10.23893/1307-2080.APS.05623 Background: The methanol extracts of leaf and flower of P. falcisepala (PFL & PFF) were evaluated for inhibitors of alpha amylase/glucosidase (AGIs) with antioxidant property. Methods: The total phenolic (TPC)/flavonoid content (TFC), antioxidant and digestive enzymes inhibitory activities of the PFL, PFF and PFF fractions; n-hexane (PFFHex), ethyl acetate (PFFEA), n-butanol (PFFBUT) and aqueous (PFFAQ) were evaluated. Results: The PFF had higher TPC, TFC, greater antioxidant and digestive enzymes inhibitory activities than PFL. Thus, PFF fractions were further evaluated. 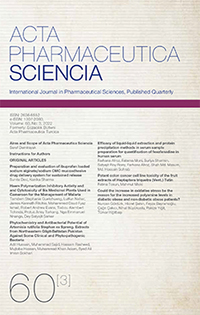 The PFFEA had the highest TPC (161.05 ± 6.18 mgGAE/g), TFC (112.54 ± 1.69 mgQE/g), alpha amylase inhibitory activity (38.45 ± 2.50 ?g/mL) than acarbose (258.4 ± 6.37 ?g/mL p< 0.05). In addition, PFFEA showed higher activities in the Fe2+ reducing antioxidant power and alpha glucosidase inhibitory assays.